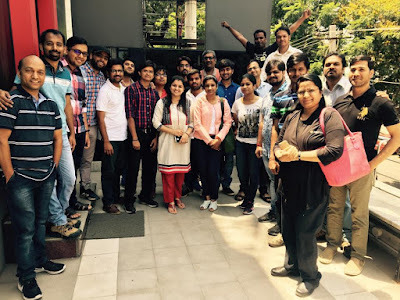 I attended Agile Testing Alliance's 12th Bengaluru Meetup hosted at Moolya Software Testing Pvt. Ltd., office on 25th March 2017. I got to know about this meetup from the Facebook share by Moolya and made my mind to be there. The audience in the meetup were software testers, Agile trainer or coach, and technical lead. I'm listing few points here out of my notes. It was engaging sessions and I had to make sure that I will listen, I make notes and tweet to people if any who were curious to know what's happening in the meetup. Audience had question around -- "Management yet to getting adapted to Agile and teams are on Agile. How to solve this so team gets much more support?" Says, "in this era we all are programmers and need to write code; testing is a specialization now." Started a group activity saying to draw start having 12 points and later he asked "why you did not ask questions but assumed?" Starts by asking, "How do you solve problem? Take a minute and let me know." He says, "focus on things which can be controlled"
Post meetup hours, was part of three interactive discussing sessions with Ajay and Pranav. I did learn discussing to Ajay and Pranav on fundamental topics of software testing, programming and practice.